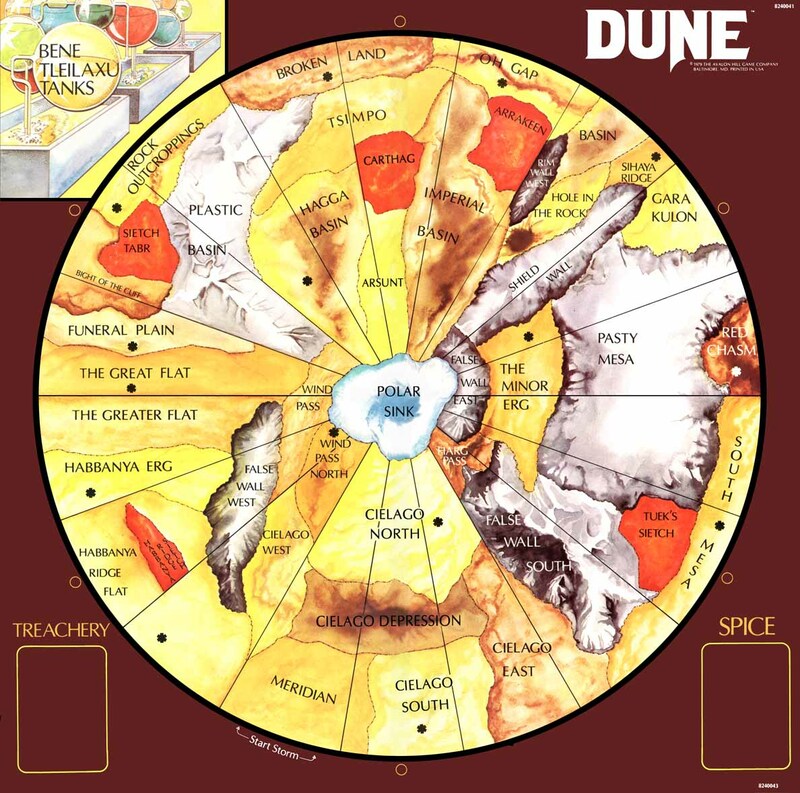 Here's a few things related to the Dune game by Avalon Hill. It's been a long time since Avalon Hill last printed the game, and it seems unlikely that Hasbro (who bought AH) ever will. I've been running into some people who are missing pieces, and to be nice to them I've decided to put online some files I've found or made myself. If you're looking for something that isn't here, let me know and I'll see what I can do. Many thanks to Tony Barber who scanned in the pictures from the French game which I've put on this site. English text with French graphics plus blank shield. A Set of House Rules (a combination of the rules that came with the game, the two supplements, various magazines, etc.) That I found floating around on the net and decided to make a PDF out of. Yahoo Dune Club - An active group where you can discuss the rules, or get involved in a Play By E-Mail (PBEM) game. Boycat's Variant Factions - Boycat's ideas for incorporating Ix, Landsraad and Tleilaxu into the game as well as links to other variants. Interesting ideas and some nice graphics (stole some from here). I was involved in a Dune PBEM game that was run by Brad Johnson on the Yahoo Dune Club. The Template that was used for game status reports. If you're interested, I have a record of all the turns that took place in this game. eBay - There are often people selling used copies of the game. In Addition to the Avalon Hill versions, Descartes published the game in French which includes both expansions: Spice Harvest and The Duel. If the copy you buy doesn't have the rules in English, just download them from this page. If you find any of this information useful or have any other comments, let me know.